1Click a shape in the Add Shapes panel and drag it onto the canvas. Double-click in the shape to add text. 2Drag shapes to move them around the canvas. You can zoom in or out using the slider at the bottom of Detail View and use the horizontal and vertical scroll bars to move around the map. 3Use the menu bar to add connectors and project items. For example, add two cases from your project and draw a connector to show the association between them. Open a case to see all the coded content. You can also drag and drop from List View to add project items to the canvas. If you want to change the map, you must enter edit mode. You cannot change the shape or color of project items—they are represented by the NVivo project item icon. TIP To make more room when you're working with maps, undock Detail View and display it in a separate window. On the Explore tab, in the Maps group, click Concept Map. Add shapes to the map by clicking and dragging from the shapes pane. 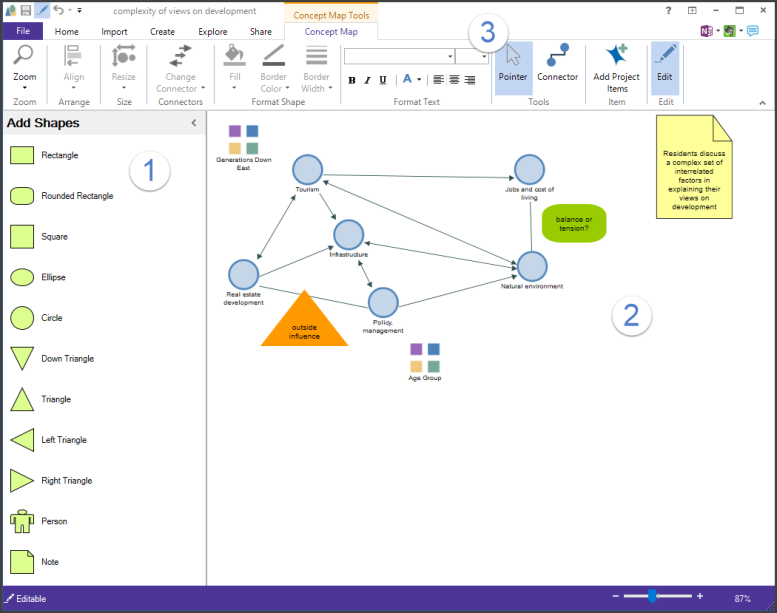 On the Concept map tab, in the Tools group, click Connector. Select a connector then press F2 to add a label to it. Double-click in a shape to edit the text. On the Concept map tab, in the Items group, click Add Project Items. The Select Project Items dialog box opens.